Provide comfort for the family of Joyce McLain with a meaningful gesture of sympathy. Joyce S. McLain, 89, passed away at Maine General Medical Center in Augusta on April 9, 2019. Joyce was born on March 13, 1930 in Owls Head the daughter of the late Ivan and Tina (Day) Scott. Joyce grew up locally and was a graduate of Waldoboro High School class of 1949. 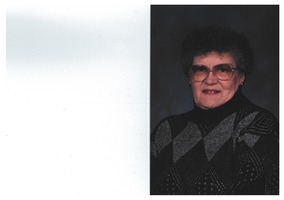 Joyce was a hard worker and proud to have worked for GTE Sylvania for 32 years. Some of her favorite things were shopping, spending time at the pond, collecting cows, and playing Uno and Phase 10. Halloween was a special holiday for her and she enjoyed dressing up every year , taking her grandchildren trick or treating and attending all of the local Halloween parties. She was predeceased by her brothers, Frederick Scott, Ivan Scott Jr. and Gordon Scott, grandson Jason Barter along with her special son-in-law Gary Barter. Survivors include her daughter Sharon Barter of Waldoboro, grandson Robert Barter and wife Lorielle of Waldoboro, great grandchildren Kaitlin Barter of Thomaston, Gabriel Barter of Damariscotta, Dylan Barter, Lacey Barter both of Waldoboro along with many nieces, nephews and friends. A celebration of life for Joyce will be held on Thursday April 18. 2019 at 11 o’clock in the morning at Hall Funeral Home 949 Main Street, Waldoboro with Pastor Tom Rawley officiating. Condolences may be shared with the family by visiting hallfuneralhomes.com. We encourage you to share your most beloved memories of Joyce here, so that the family and other loved ones can always see it. You can upload cherished photographs, or share your favorite stories, and can even comment on those shared by others.